After scoring in the practice game against Akwa United on Wednesday, Brown Ideye says the match against Tanzania is a must win one. Nigeria plays its final 2017 AFCON Qualifying game against Tanzania on Saturday in any encounter dubbed “dead rubber” but Ideye believes it is more important than that. “It’s a very important game. I won’t it is not important because we are not going to the AFCON. “It’s a very important game for us to win. 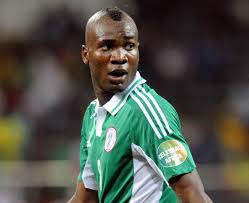 I do not see any pressure on both sides so we will just enjoy the game and it will be an opportunity to play well and score goals too,” Ideye told Naijafootball247.com. “The game against Akwa United was also good for us. You know most of us just arrived two days ago and it is good for our fitness that we played this game,” he said. Ideye played upfront with Victor Osimhen and Imoh Ezekiel and got the first goal of the encounter in a 3-0 win. Nosa Igiebor and Odion Ighalo got the other goals.